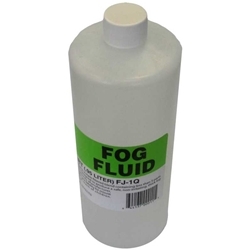 Fogger uses FJ-10 water based fog fluid. Safe, clean, easy to use water base fog solution creates thick, dense fog. Packaged in a one quart or gallon container. Unfortunately, due to FAA regulations this item cannot be shipped Next Day Air, Express, or International. Please refer to our shipping times to determine the approximate shipping time of this product.